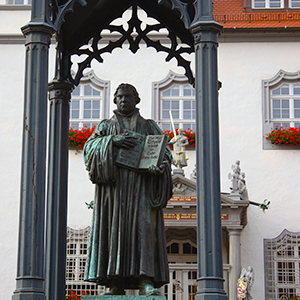 This very special trip focuses on Martin Luther. Starting in Berlin, visit the Kaiser Wilhelm Memorial Church and take pictures of Brandenburg Gate and the Holocaust Memorial. In Wittenberg, see Luther House, and visit St. Mary’s Church and Melanchthon House. Continue to Leipzig to visit the Thomaskirche, where J.S. Bach worked. Also included are visits to Luther’s Birthplace Museum, Luther’s Death House Museum, St. Andrew’s Church, and St. Peter & Paul Church in Eisleben. Visit the Augustinian Monastery and Merchant’s Bridge in Erfurt; Wartburg Castle, where Luther translated the New Testament, Luther House, and St. George’s Church in Eisenach. Visit Coburg Fortress and Worms, where the Imperial Council passed judgement on Luther in 1521. Visit the cathedral where Luther presented his case, Trinity Church, and the famed Reformation Monument. In Mainz, visit the Gutenberg Museum, and enjoy a romantic Rhine River cruise through the prettiest part of the Rhine Valley. Next is the medieval walled town of Rothenburg, famous for its Christmas ornaments, to visit St. Jacob’s Church with the renowned Blood Altar. Follow in Luther’s footsteps to Nuremberg and visit St. Lorenz Lutheran Church, and to Augsburg, where Luther and his followers proclaimed their beliefs. End in Munich and visit Marienplatz with its Old and New Town Halls. An optional excursion to King Ludwig’s Linderhof Castle and the Passion Play town of Oberammergau is available. In the evening, enjoy a farewell dinner at your hotel. Welcome to Berlin! At 6 pm, meet your Tour Director and traveling companions, then enjoy this evening’s welcome dinner with wine at your hotel. Sightseeing with a Local Guide in the once-divided metropolis includes the elegant Ku’damm, the restored Reichstag, Charlottenburg Castle, a picture stop at monumental Brandenburg Gate, the Holocaust Memorial, and the 21-foot Victory Column in the vast Tiergarten park. Visit the KAISER WILHELM MEMORIAL CHURCH with its bomb-damaged tower, drive along Unter den Linden boulevard, and pass the State Opera House and Checkpoint Charlie. In the afternoon, continue to Wittenberg, Martin Luther’s home for 30-plus years and birthplace of the Reformation. Enjoy a guided walking tour and see Luther House, where Martin Luther and his family lived. Visit St. Mary’s Church, a twin-towered gothic church where Luther preached the Reformation, got married (1525), and baptized his six children. Finally, see the door of the Castle Church where Luther posted his 95 Theses against the sale of indulgences—and launched the Reformation in 1517. A special visit has been included to the renaissance-style MELANCHTHON HOUSE, built in 1536 and today a UNESCO World Heritage Site. It belonged to Philipp Melanchthon, Luther’s closest friend and most successful co-worker. Arrive in Leipzig for your walking tour and visit the THOMASKIRCHE, where J.S. Bach worked. It is the home of the St. Thomas Boys Choir and a place of musical creativity. Also visit the market square that today is a site for celebrations and festivals, but once was the scene of executions and political demonstrations. Today, stop in Eisleben, and visit LUTHER’S BIRTHPLACE museum, LUTHER’S DEATH HOUSE MUSEUM, St. Andrew’s Church, and St. Peter & Paul Church. Later, drive to Erfurt, where the fine gothic and renaissance buildings evoke memories of the days of Dominican Master Eckhart and Martin Luther, who spent his student days here before embarking on his journey to Wittenberg. Highlight of the day is a visit to the AUGUSTINIAN MONASTERY, where Luther lived as a monk, and the MERCHANTS’ BRIDGE. Journey to Eisenach and enjoy a guided visit to WARTBURG CASTLE, where Luther translated the New Testament. Also visit LUTHER HOUSE, ST. GEORGE’S CHURCH, and see the Luther and Bach Memorials, Nikolai Church and Gate, through which Luther passed whenever he entered or left Eisenach. Return to Erfurt. In Coburg, where Luther stayed in 1530 for the Imperial Diet of Augsburg, visit fascinating COBURG FORTRESS, one of the largest surviving medieval fortresses in Germany. In Worms, where the Imperial Council passed judgment on Luther in 1521, visit the CATHEDRAL where Luther presented his case, as well as TRINITY CHURCH and the famed REFORMATION MONUMENT. Later, enjoy a scenic RHINE CRUISE past castle-crested cliffs, terraced vineyards, and trim, half-timbered towns. Evening at leisure. This morning, visit the GUTENBERG MUSEUM in Mainz, where original copies of the Bible can be seen. Next is the medieval walled town of Rothenburg. During your walking tour, visit ST. JACOB’S CHURCH with the renowned Blood Altar. Afterwards, there is time to shop for Christmas ornaments, for which this picturesque town is world famous. Continue to Nuremberg, the first town to accept the Reformation in 1525. Your walking tour in Nuremberg features the famous ST. LORENZ LUTHERAN CHURCH. Continue to Augsburg, where your guided sightseeing reveals the city where Luther and his followers proclaimed their beliefs. Arrive in Munich. Sightseeing with a Local Guide of Germany’s “Secret Capital” includes the Olympic Stadium, 1,000-foot-high Television Tower, MARIENPLATZ with the Old and the New Town Halls, and the gothic Frauenkirche. An optional excursion to Linderhof Castle and the Passion Play town of Oberammergau is available. Tonight, enjoy a farewell dinner with wine at your hotel. The Luther-Hotel with 159 modern guest rooms is located in the middle of the historic city center of Wittenberg, where many cultural events take place. A special highlight is the sauna on the 4th floor. Impressive 27-story hotel located in city center, 300 meters from train station and close to museums and monuments. Modern 14-story Hotel located 2 km from train station & 10 km from Erfurt-Bindersleben Airport. Set on the edge of the picturesque old town of Mainz, overlooking the River Rhine, Hilton Mainz offers contemporary accommodation. The central location in the heart of the city puts cultural sights and shops within easy reach.